Twister Bar upper Body workout Materials: Quality Carbon Steel Springs and Non-Slip Plastic Handle with a rope protection lock.Harness the safety rope in the lock onto your wrist before using, for great protection Perfect For Building Upper Body Strength.Ideal for active men and women who exercise daily at their home or office.This great workout accessory will help you build your body effectively. Chrome plated, and comfortable Foam grips on feet and hand. Perfect for indoor and outdoor use. Easy to Maintain, Lightweight and easy transportation. With the stable base that considerably reduces wrist strain. This is extensively used in various Gym and Health Centers to get varied health benefits. In addition, these fitness equipment are incorporated into the features like flexibility, durable finish standards, and corrosion resistance. This Handle Pulling Exerciser is easy to grip and it is a great way to keep health and improve strength. You can exercise in different ways using this Pulling Exerciser: Pull overhead helps broaden upper back, pull behind back helps build arms and holders, holdout stretch to sides helps strengthen upper back and arms etc. For beginners, the middle several springs in the Spring Chest Expander can be removed to reduce the intensity of tension. After exercising for a long time, the removed springs can be put back on to increase the tension. Dumbbell 6Kg are available in varieties of shapes, most interesting being hexagonal. The hexagonal ends offer good support, have the flat base. The best feature of Dumbbell 6kg is that they have ergonomically carved edges giving unprecedented support and safety to the user. A combination of small weights can also be used to make Dumbbell 6kg. Dumbbell 2Kg are available in varieties of shapes, most interesting being hexagonal. The hexagonal ends offer good support, have the flat base. The best feature of Dumbbell 2kg is that they have ergonomically carved edges giving unprecedented support and safety to the user. 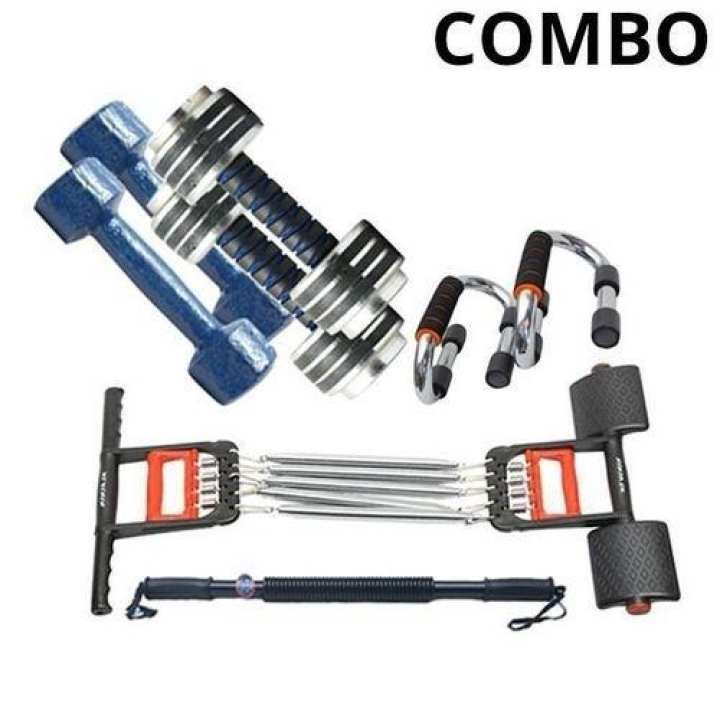 A combination of small weights can also be used to make Dumbbell 2kg.